This is one of the most important cars for Mercedes in India. Mercedes is entering a segment which has so far been exploited by the likes of Audi Q5 and BMW X3 for a while now. Internationally Mercedes has the GLK but it was getting long in the tooth and the Stuttgart giant waited for a brand new product to drop the floor from beneath its competition. Meet the GLC-Class, an SUV which in theory should give Mercedes a distinct advantage, considering he Audi Q5 and the BMW X3 are already quite old. It looks fantastic on the outside, is elegant on the inside and its proven mechanicals just makes it very strong on paper. Now thanks to local assembly the GLC-Class is really well priced as it undercuts all its rivals by a considerable margin. So just how good is the new GLC? We conducted a thorough road test on both the petrol and diesel versions to give you a definitive answer. Images of the vehicle on the web leave you with the impression of a well structured, powerful looking vehicle that you don’t think twice about loving. We’ll admit, the vehicle’s robust and masculine stance is nothing like what we’ve seen in conventional, domestic models. Nevertheless, there are feminine themes that overlap with its strong form, and this is what we thought struck the best look possible. The tall and bulky vehicle has been tailored for a graceful shape, and this brings a modern note in its image. The muscular body lines have been smoothly textured, giving a far more attractive overall delight. It begins drawing viewers in with a face shaped with an aggressive allure, at the focus of which is a large radiator grille. A thick chrome furnishing stretches across the grille, with the large star-emblem resting at the centre. We know for one that a more distinct image is carved by factors like these, and they ultimate give the vehicle the true grandeur of a Merc. At the bottom, the air intake section is embraced by thick chrome artistry. The headlamp clusters on either side are slim and eye catching, and we thought they complete the picture of the front perfectly. The hood has been refined with subtle lines that we thought made for a more awe-inciting vision. The fine curvatures that run across the bonnet further enhance the look, and there was an overall solidity in the design that we haven’t witnessed in any other vehicle of the day.The flawless metallic skin drapes down from the bonnet into the side profile, wrapping over the wheel arches in a neat fashion. There was a more well toned, prominent bearing in the wheel arches that is sure to attract the attention of younger car lovers.When you take a look at the side, you can’t help but feel amazed at the serene body lines printed over the door-side. We felt an indomitable spirit of luxury and richness exuded by this set-up, and we’ll give the company hats-off for it. The 5-spoke well nurtured alloy wheels are also striking, and the well sculpted design further brings out the best in the vehicle’s appearance. As you trace the shape of the vehicle, you find that the rear area has been beefed up nicely, giving a more harmonious exhibition. There was also an element of grace in the structural disposition, so much so much so that the bulky machine almost has the tone of a sports car if viewed from far away. At the rear, the the slender headlamps stretch from the interior of the tail-gate to the side, and we thought there was an inherent, sporty design in them that most people would love. A large chrome strip rests at the bottom of the rear, while the sporty design of the exhaust vents finish the picture off in the cleanest way possible. The 2017 Mercedes-Benz GLC-Class‘ interior is nearly identical to that of the C-Class sedan on which it is based, and that’s a very good thing. The modern design features a graceful center stack wrapped in a single wood veneer as it transitions into the center console. The quality of materials and solid construction are excellent. Only essential buttons and knobs are present, with supporting systems controlled through the infotainment system. The driver interface system employs a dial controller, much like the ones found in Audi and BMW rivals, but it does take a bit longer for new users to get used to how the menus are organized and operated. Once acclimated, it becomes second nature. The Premium 2 package adds a touchpad controller that hovers above the dial and accepts smartphone-like gestures (pinch-to-zoom and swipes) as well as alphanumeric fingertip traces. It’s an intriguing concept, but it requires a very steady hand and quite a bit of patience. The good thing is you can still control everything through the dial as well. Despite having a compact SUV footprint, the GLC interior is remarkably spacious and comfortable. The front seats are optimally shaped and padded for hours of touring, and the rear seats easily accommodate 6-foot-tall passengers. Cargo capacity is smaller than competing luxury SUVs, with 20.5 cubic feet behind the rear seats and 56.5 cubic feet with them folded flat. Though smaller, the cargo space is still very useful and likely enough for your needs. The standard power-folding rear seats and available hands-free liftgate are especially convenient when loading bulky objects. The lower-powered version of the four-cylinder 2.1-litre diesel engine (badged 220 d) is fast enough to satisfy the desires of most SUV buyers. The 250 d model is noticeably stronger at low and mid revs, however, which allows the standard nine-speed automatic gearbox to keep the engine revs lower and whisk you up to speed in a more relaxed fashion. It’s worth the relatively small premium. The 3.0-litre V6 diesel gets the same nine-speed gearbox, and the engine and ‘box work well together. The V6’s smooth power delivery helps make it the most luxurious GLC to drive, although it’s capable of keeping up with hot hatches should you need it to. The top of the range GLC 43 AMG (before a V8 GLC 63 joins the range later) is powered a 3.0-litre twin-turbocharged V6 petrol engine, which drives all four wheels through a nine-speed automatic gearbox. It’s incredibly quick, beating the Porsche Macan and Audi SQ5 for straight line pace. Just be aware that this impressive performance comes at the price of terrible fuel economy. It feels like a Mercedes. That means solid and refined, reacting with measured consideration to your inputs. It’s not sporty, but if you want sporty you might be better advised looking away from crossovers anyway. The higher engine tune doesn’t provide much more performance, and both are decently quiet. The suspension is, optionally, by air springs. That’s the version we tested. The ride is supple and quiet but the body stays well damped. Steering is progressive rather than agile or direct. The SUV part of the job description turns out to be a core skill. It’s got good electronic traction and descent aids, enough suspension travel and good clearance, especially when fitted with liftable air springs. Good for towing, too. 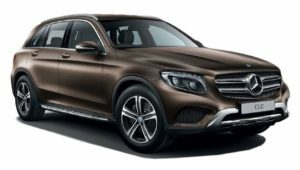 Standard safety features for the 2017 Mercedes-Benz GLC300 include antilock brakes, traction and stability control, front-seat side airbags, a driver knee airbag, full-length side curtain airbags, trailer sway control, crosswind assistance, a forward collision warning system, a forward collision intervention system with automatic braking, Pre-Safe (takes measures to secure the cabin and occupants when a crash is imminent) and a drowsy driver warning system. The Mbrace Secure telematics system includes automatic collision notification, emergency assistance, agent-assisted remote unlock and stolen vehicle location assistance. Features such as blind-spot warning (and automatic intervention), lane departure warning, lane departure intervention, enhanced forward collision intervention with pedestrian detection, and forward cross-traffic collision detection and intervention are available with the Premium packages. The Mercedes-Benz GLC competes in a segment where demand is high. Buyers prefer mid-size luxury SUVs when they find their sedan counterparts to be lacking in space, ground clearance, etc. This segment is hard to crack since there are a lot of competitors and each one of them offer something unique. Mercedes has a really good package on their hands with the GLC and it will definitely be a very good choice for someone who wants a luxury SUV with all the creature comforts, good space for passengers and good cargo capacity. Hence, the GLC is a very good alternative to the Audi Q5, Volvo XC60 and the BMW X3 in this segment.